The House Theatre of Chicago presents THE MAGNIFICENTS. It’s 1933 in Small Town, USA. Magnificent is an aging magician. He and his wife Rosie have assembled a band of misfits for their traveling circus. Under their big top, people gather to be entertained by the amazing feats. HoneyDew twirls from aerial silks. Chase provides the comic buffoonery. And Harley impresses as a strongman. And of course, Magnificent, himself, mystifies the crowds with his mind-blowing magic. After a young show crasher is caught stealing, the makeshift family have to decide if there is room in their hearts for one more. THE MAGNIFICENTS *are* The Magnificents! Playwright Dennis Watkins has penned an ode to his grandfather. First, introduced in 2007, THE MAGNIFICENTS returns renewed and refreshed. And this resurrection is phenomenal! Watkins’ story is not only a touching tribute to his past, it’s a beautiful sentiment of his present. The idea of a make-your-own-family is powerful. Under the skillful direction of Nathan Allen and the ringmaster magic of Watkins, I laughed, I cried, I wondered. A charming showman, quick-talking Watkins performs his brilliant illusions. There are interactive acts that are just baffling marvels. Everyone in the audience is left with eyes popping, mouth gaping, head scratching. Watkins is indeed a wizard! Allen also uses his special powers to pull a talented ensemble out of a truck. Graceful Lucy Carapetyan (Honeydew/Aerial coach), spunky Tien Doman (Rosie), agile Tommy Rapley (Boy/Choreographer), hilarious Michael E. Smith (Chase), and stalwart Jeff Trainor (Harley) are the spectacular, the one and only, the incredible: *The Magnificents*. Set and Light Designer Lee Keenan creates the perfect truck for a traveling circus. A big run-down truck folds out the dazzle with lights, curtains, smoke and mirrors. It’s a casual stunner as the ordinary becomes the platform for the extraordinary. 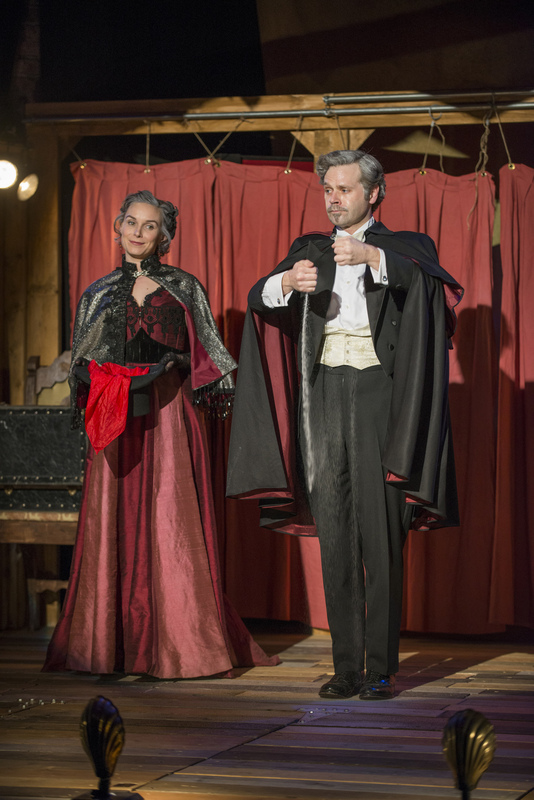 Costume Designer Melissa Torchia mixes up the elegant refinement of Watkins and Doman with the carnie garb of Carapetyan, Smith and Trainor. The eclectic mish-mash adds a stylish sense of play. It’s fun. It’s lovely. It’s magic. Watkins called it! Every aspect of THE MAGNIFICENTS is magnificent. Right now, THE MAGNIFICENTS may be the best show on earth! Get your tickets before Watkins & crew perform their vanishing act. Running Time: Two hours includes an intermission.